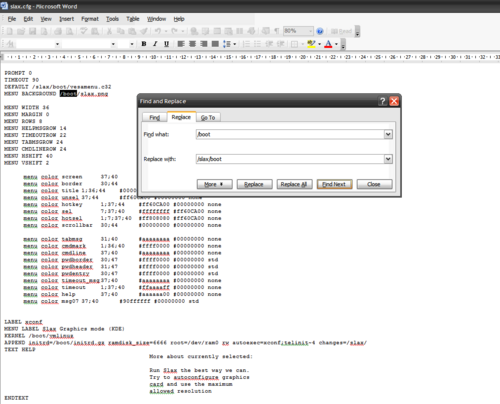 Slax is a freely available, modular Linux distribution. That is, you can add and remove functions by adding or deleting modules or even disable some at boot time via boot parameters. The website allows you to choose modules and download a ready customised ISO with everything you've asked for, so you don't even have to fiddle with command-line interfaces before you can use the system! This tutorial will show you how to add Slax to the UBCD arsenal. However, this tutorial is based on Windows so Mac and Linux users will need to modify certain instructions per their system's architecture and capabilities. Firstly, download the latest version of the UBCD ISO from here and extract it using your favourite archive manager (7zip is easy to use and free, and documented in Remastering the UBCD ISO). 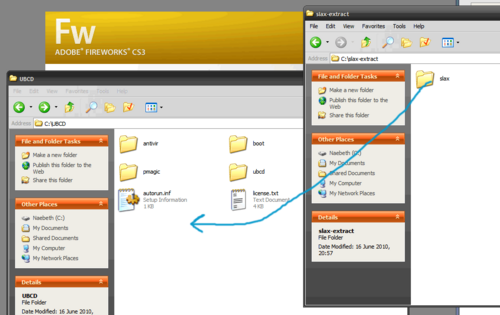 I have extracted it to C:\UBCD for this tutorial, but the folder name doesn't really matter. Secondly, download a customised or standard Slax ISO. The name of the ISO does not matter particularly, but for the purposes of this tutorial I have simply used "slax_ubcd.iso". Finally, delete the folder in C:\UBCD named [BOOT]. It appears that the same method works for both CD/DVD and USB media, whereas Isolinux usually caters for CD/DVD and Syslinux for USB - HOWEVER I do not have the means to test USB support. 1. 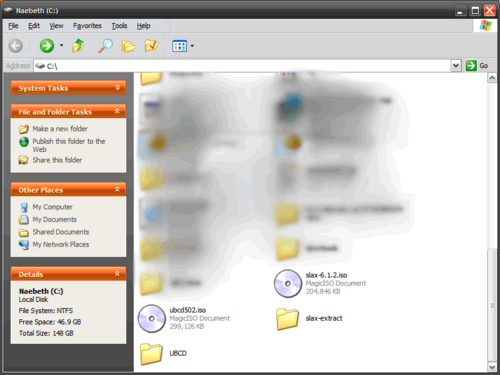 Extract your Slax ISO to C:\slax-extract and move the "boot" folder into the "slax" folder. 2. Copy C:\slax-extract\slax to C:\UBCD. This option will boot into a pre-configured Slax Distribution. 4. Open C:\UBCD\slax\boot\slax.cfg and add "/slax" to the beginning of EVERY directory listing. Seriously, every single one. Otherwise things will go wrong. 5. In the same file, delete ALL occurrences of "changes=/slax/" - seeing as you're booting from CD, saving changes isn't exactly possible. 6. Remaster the UBCD ISO as per these instructions. 7. 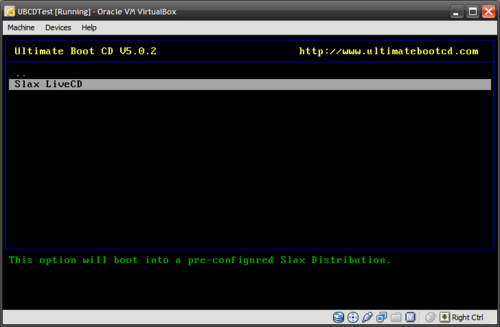 Slax is now accessible from the "User-defined" entry of the UBCD boot menu. 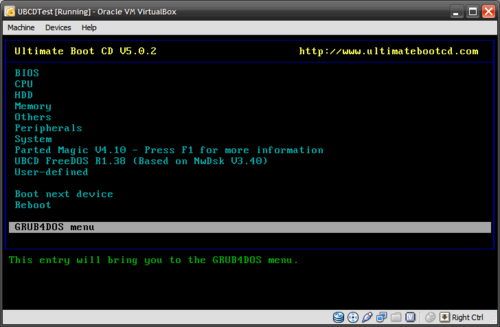 Personally, I prefer Grub4Dos but I decided to do it last as it is not the default menu system of UBCD. 1. 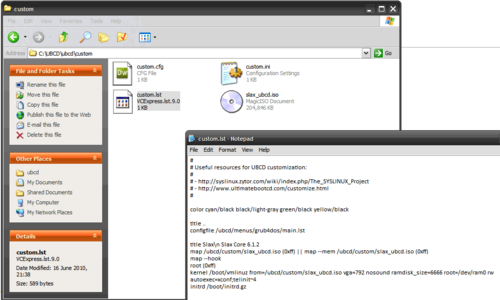 Place your Slax ISO into UBCD's custom folder, so it should be something like C:\UBCD\ubcd\custom\slax_ubcd.iso). 3. Remaster the UBCD ISO as per these instructions. 4. When booting, choose the final option of UBCD's initial boot menu, then go to the User-defined section of this screen, and then you will see the Slax entry. It will not appear under User-defined of the initial menu. I have tested both menu system in CD/DVD media, but not on a USB so be warned that these instructions may not work. I do intend to edit them with sub-sections should the current methods fail on USB media, but I'll need you to get in touch with me so that I know they fail. This page was last edited on 11 November 2010, at 04:06.